Foam Flower (Tiarella cordifolia): growing, planting, caring. 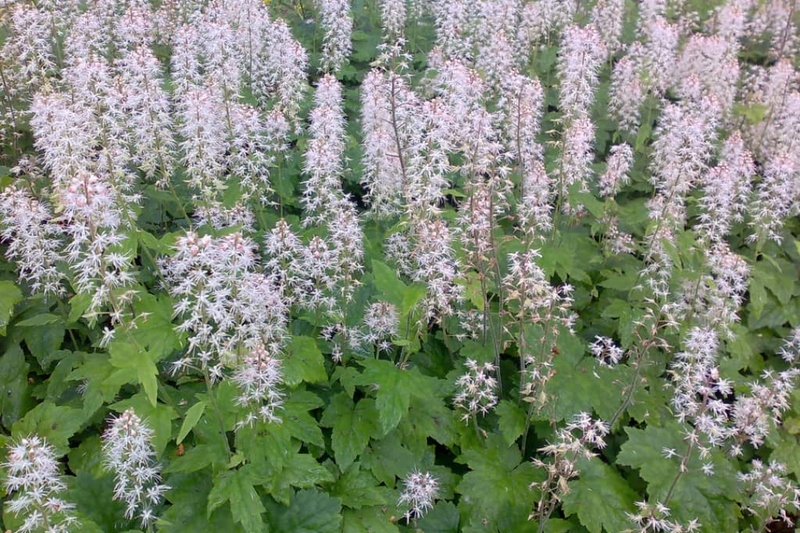 Full description for Tiarella cordifolia not yet available. The heartleaf foamflower are small rhizomatous perennials. Plant your heartleaf foamflower in semi-shade or in the shade, in fresh or humid soil, rich in humus, in spring or autumn. They are able to adapt elsewhere, but they will not be vigorous. Pot cultivation is possible provided that it can be kept moist and fertilized regularly. In the open soil plant every 30 cm to get a nice carpet of flowery cushions. Unpack the soil with a pitchfork, add compost, arrange your plants regularly and plant them without burying the leaves. Water copiously and mulch. In pots, plant in a mix of loam and compost. Plan a container 30 or 40 cm deep if you do not want to water too often. Plant rather staggered to avoid the row effect and do not bury the leaves. Water, mulch with some compost or potting soil. Place the pot or tray in the shade, preferably. If your heartleaf foamflower are beside perennial geraniums or other very vigorous shade cover, help them by clearing the space between. The first months, water twice a week in the ground, and every day in pots. Water during the summer period without excess, twice a week if it is very dry, rather in the morning and sparing the leaves. When your plants are well developed, you can divide them with a sharp tool. Disinfect it to limit the spread of diseases, then cut the tuft in two and replant.